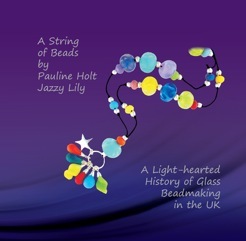 A String of Beads by Pauline Holt,Jazzy Lily. A light-hearted history of Beadmaking in the UK. Documenting the recent resurgence in glass bead making in writing, Holt gives us a brief insight into the history of glass bead making including important events not to be missed, contemporary lampwork artists and a few basics for any lamp work artist. Pauline started bead making as a simple hobby in 1993. She began making jewellery from bought-in beads but her passion now is making her own handcrafted beads.